In a small saucepan, combine the vinegar, sugar, bay leaf, 1/2 teaspoon of salt and 3/4 cup of water. Wrap the cardamom, peppercorns and coriander seeds in a cheesecloth bundle and add to the saucepan. Simmer the brine over moderate heat for 10 minutes. Put the prunes in a heatproof bowl, pour the brine over them and let stand for 2 hours. Drain the prunes, reserving the brine. Discard the spice bundle and bay leaf. Simmer the brine until it coats the back of a spoon, 10 minutes, then pour over the prunes in the bowl. Preheat the oven to 300°. Spread the pistachios on a baking sheet and bake until lightly browned, 12 to 15 minutes. Transfer to a food processor and let cool. Add the garlic and lemon zest and process until finely chopped, 1 minute. Add 2 tablespoons of the olive oil and 1/2 cup plus 2 tablespoons of water and process until a smooth paste forms; season with salt. Light a grill. In a large bowl, toss the spring onions with the remaining 1/4 cup of olive oil and season with salt. Grill the onions over moderately high heat until tender and lightly charred, 6 to 8 minutes. Quarter 8 of the prunes. (Save the rest for another use.) Spread the yogurt and pistachio butter on a platter. Top with the grilled onions and season with the Urfa pepper. 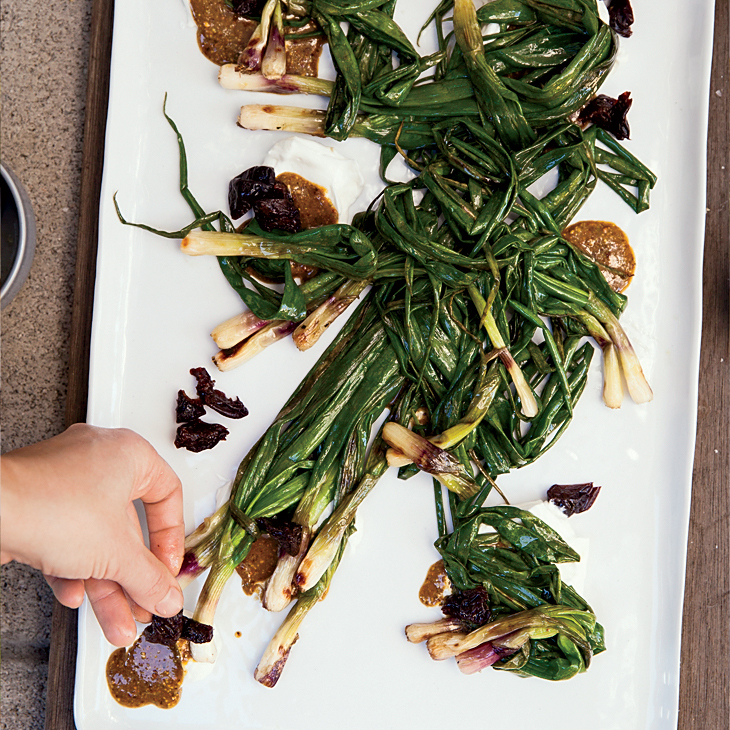 Garnish with the prunes, mint leaves and a drizzle of olive oil; serve immediately. An Aleppo pepper (pronounced Uh-LEPPO) is a dried ground pepper from Syria and Turkey. It's mildly spicy, tart and fruity. An Urfa pepper (pronounced ER-fah) is a smoky, coarsely ground Turkish chile.